Some say it derives from a nineteenth-century secret political society called: "Carbonari". Others believe it comes from Abruzzo's and Lazio's coal miners lunch. Whatever its origin it's a Roman dish served in trattoria (local restaurant) of many Italian cities. 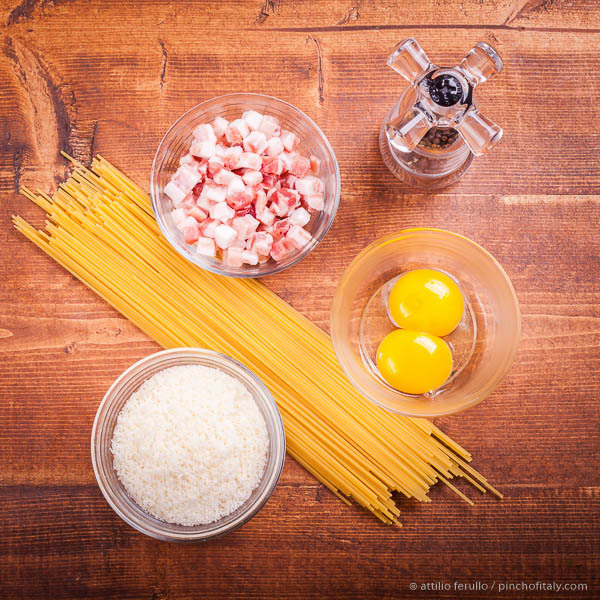 Spaghetti alla carbonara could have many variations that include adding a little garlic, onion, hot pepper and parsley. 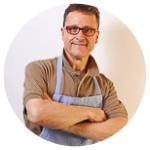 But the Italian-American variation is too often made with the addition of heavy cream or even another pasta shape like rigatoni. 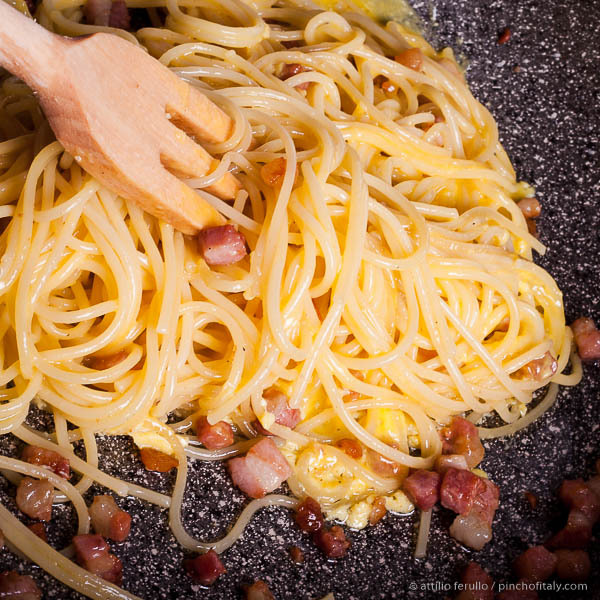 I think this dish is best at its purest with the only flavors of the Italian "guanciale" or "pancetta" and the Pecorino cheese to enhance this egg-coated spaghetti recipe. Begin by beating with a whisk the yolks of 2 eggs, add a pinch of salt and fresh milled black pepper to taste. 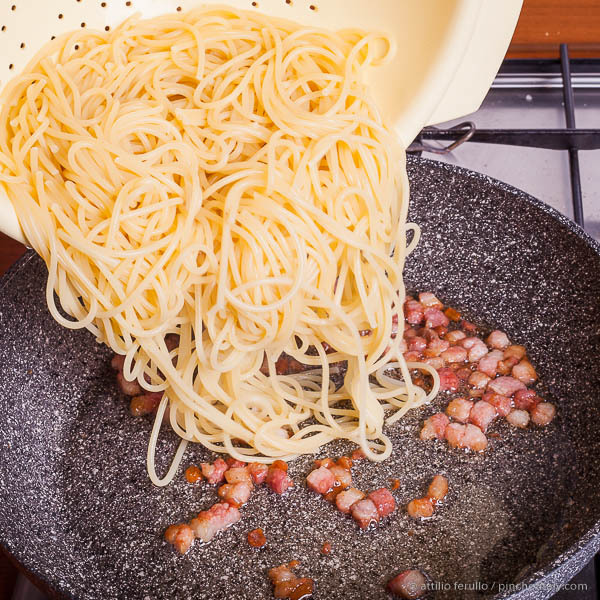 Take a frying pan, add sliced strips of guanciale or diced bacon. Cook for a couple of minutes until the fat has become transparent and slightly crisp then turn off the cooker. All the above can be done while the pasta is cooking so once ready first drain and then throw the spaghetti or rigatoni in the frying pan while they are still hot. Take the beaten eggs with black pepper and pour it over the pasta. Mix the whole with a wooden fork until the eggs mixture turns to a thin emulsion. Add the Pecorino and/or Parmigiano Reggiano the one of your choice and give a last stir. Now it's ready to plate and serve immediately with some extra grated cheese to taste. The authentic recipe does not use heavy cream, so leaving spaghetti lighter and less caloric, but willingly is a variation to try. Another variation is to use half dose of Pecorino Romano cheese and half dose of grated Parmigiano Reggiano. Anyway the authentic carbonara just calls for Pecorino Romano which is best for this recipe. If you like or don't have pecorino cheese instaed you can use Parmigiano Reggiano. 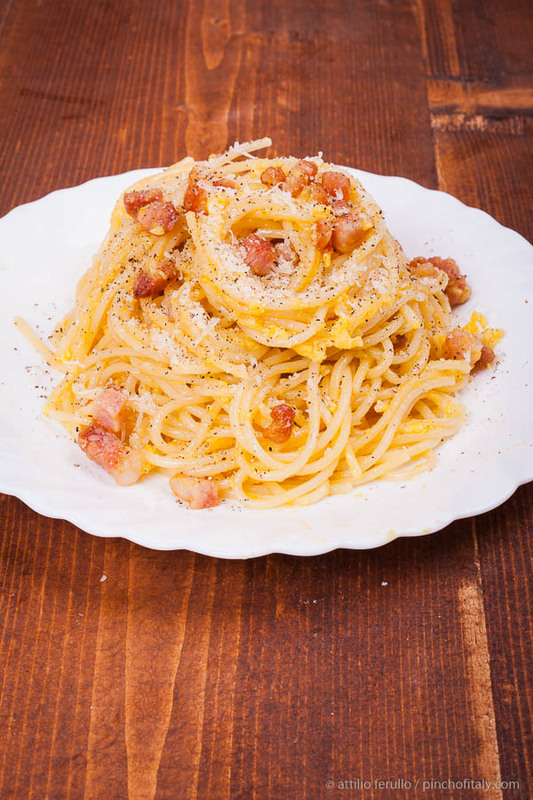 I'm sure you can have a much better carbonara when in Rome than the one described here. Mainly, because it’s difficult to find authentic guanciale (pork cheek) at grocery stores abroad. It’s a real mission even for me that I live in Italy, so that’s why it’s easy to fall back on diced bacon. I tried to do my best but I could only put my hands on some diced bacon I founded at the grocery store. Maybe I could have done a better job searching longer for a piece of guanciale, but instead I held on. I thought I don't want to dishearten you if you might not find guanciale were you live. Scale up and double the ingredients if you need 4 servings and anyway an egg yolk for person. Yes, spaghetti or rigatoni pasta shape makes carbonara a simple recipe and yet very tasty. 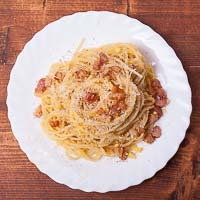 Another easy spaghetti recipe I like to make that you can try is spaghetti alla puttanesca with olives and anchovies.